It was a weak ground ball to third base that ended over a century’s worth of baseball futility. On November 3, 2016, the Chicago Cubs won their first World Series in 108 years. Much like the Red Sox win in 2004 that also put the brakes on a similar streak, it propelled the Cubs into another stratosphere in terms of popularity. The following April, according to the Los Angeles Times, four of the top five player jersey sales were Cubs. Players appeared on talk shows and late night comedy sketches. Even the backup catcher had his moment in the sun, with a second-place finish on Dancing with the Stars. Despite this popularity, many people don’t know why the Chicago Cubs are named after a baby bear. After all, there are no longer any wild bears in Illinois. Here’s the story of how they got that name and the sad story of their real life bear mascots who used to join them in the dugout. 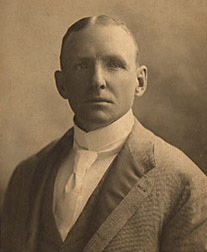 In February of 1876, Chicago businessman William Hulbert (known for grocery stores and selling coal) formed the National League of Professional Baseball Clubs. His Chicago White Stockings – called such because of the color of their uniforms and socks – were one of eight charter members, along with teams from Boston, Cincinnati, Louisville, New York, Philadelphia, St. Louis and Hartford. Play began in April that year with A.G. Spalding (yes, of ball fame) as player/manager. Later that year, the White Stockings would become the first National League champions. It’s important to emphasize here that at this point in baseball history, team names weren’t necessarily created by anyone involved with the team. They were often, as we would call it, “crowdsourced” – perhaps a newspaper writer or a fan noticed a particular trait about the club and would conceive a nickname based on that. Unsurprisingly from this, they could be known by several different names. As for “Anson’s Colts,” the name got shortened to simply the Chicago Colts. Anson continued to manage and play for the Colts during the 1890s, but his numbers dwindled slightly from his insane peak, and his arrogance (like insisting that he play every day despite being 45 and somewhat past his prime) rubbed players the wrong way. His contract finally expired on February 1, 1898 and the team refused to resign him. Anson was mad, but his great playing career was finally over. As a snide joke, local newspapers began calling the team the Chicago Orphans in that they lost their “father” Anson. That name, too, stuck for several years. They were also sometimes called the “Rainmakers” because a number of their games were rained out that year. The Orphans (though, they were still called the Colts at times) were not a particularly memorable team from 1898 to 1901, even though they did feature a young Frank Chance (of “Tinkers to Evers to Chance” fame). Now, it was common at this time to call young baseball players “cubs,” but what made this a little different was the choice to capitalize the “C”– making it a proper noun. There has been some speculation that this wasn’t intentional, but perhaps a typesetting error, given that the article content seems to refer to the young players on the team as the “cubs” and not the whole team. However, the sub-headline of the piece would seem to refer to the whole team, so perhaps it was intentional. Either way, this caught on and for the next several years, “Cubs” became one of the accepted names of the team, along with “Colts,” “Orphans,” “Remnants,” and “Microbes,” with the latter originally intended as an insult because of the ongoing dispute between St. Louis and Chicago about the flow of the bacteria-filled Chicago River. 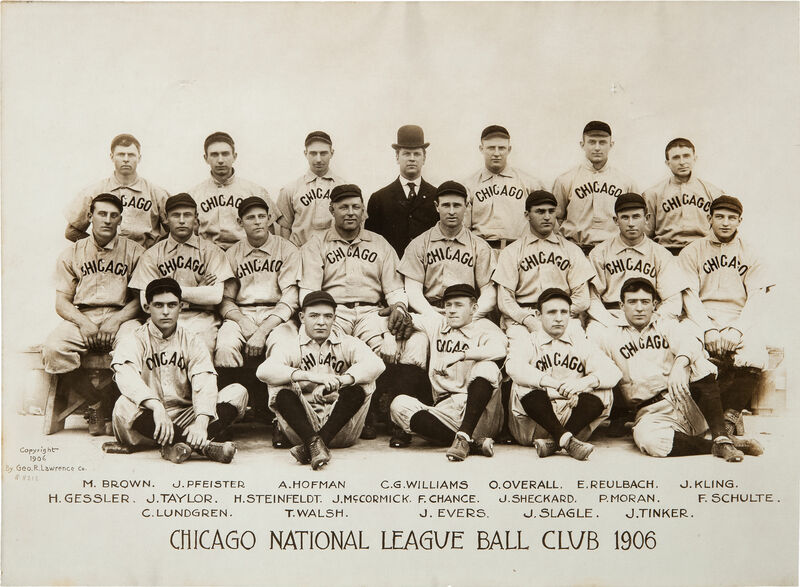 However, by 1907, the team was almost universally referred to as the Chicago Cubs. 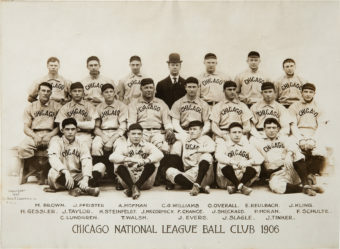 The next year, in 1908, the team embraced the name and started taking it literally. Despite having won the World Series in 1907 and the year previous in 1906 setting a record of winning 116 games (a mark only matched in baseball history by the 2001 Seattle Mariners), they thought it was necessary to have a good luck charm in the form of a mascot. (At the time, team mascots were taken very seriously as genuine good luck charms, rather than just a marketing move for kids and the like.) Thus, they brought aboard a Boston bull terrier puppy named Bud. However, fans didn’t take to a dog being the mascot of a team commonly called the Cubs. So, the team got a person and put them in a weird-looking polar bear suit. Fans liked that a lot more, though history wasn’t kind to the photos of the team with the polar bear. A few years later, the team brought in an Alaskan black baby bear named Clara Maduro. 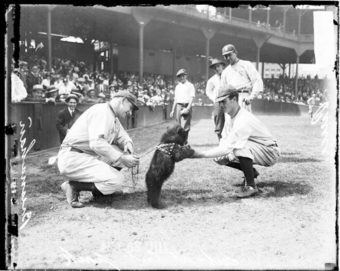 Despite the cute photos, the Chicago Tribune reported that the bear was “too strong and determined in its ways to be among peaceable people.” They were forced to send the bear to the Lincoln Park Zoo. In 1916, a Montana bear that was on its way to the stadium to entertain fans escaped its crate and made its way into a tailoring factory. It was promptly shot. But the team was undeterred and got another bear mascot, named Joa, who lived in a simple circular cage outside of the Weeghman Park (later, renamed to Wrigley Field). As you might imagine from the conditions in which he lived, he was surely, once clawed a player and was often seen chewing his steel chain in an attempt to free himself. 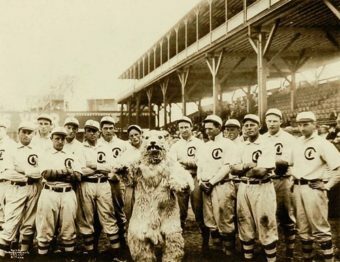 Nearly a century later, the Cubs debuted another bear mascot – his name was Clark and he was animated. The origin story the team concocted was that the cartoon Clark had heard stories growing up of his great-grandfather Joa’s exploits as the Cubs’ mascot and was inspired to follow in his footsteps… Of course, had he actually known anything about Joa’s sad tale he might have run the other way instead. Nevertheless, after the team’s World Series win, Clark the Cub was seen partying with the team and marching in the celebration parade with them.